Anyone who has sifted through comments on social-media pages and news websites, can understand that finding interesting content can be a hassle. To their credit, developers for these sites have attempted to craft ways to “reward” commenters for posting interesting and good material, but it seems that they have yet to really figure out how best to shape these discussions. Talkino is a new, Czech-based service which aims to make something useful of the hundreds and thousands of comments which people leave on stories of all kinds. Essentially, the applet works by allowing users (once they’ve created an account, of course) to share comments with likeminded people (determined by Talkino “black box”), as well as up or downvote other people. Unlike Facebook comments, which are “liked” and spread from and to your supposedly likeminded Facebook friends, Talkino’s comments are spread amongst the likeminded commenters that are not part of your social network, but who participate in the Talkino commenting system. 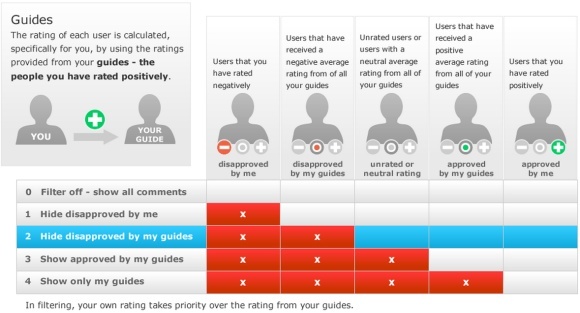 This service allows users to downgrade unimportant commenters and upvote those who seem to provide valuable content. The image above explains the “black box”: essentially if you upvote a commenter, you start following him or her, and if that person upvotes or downvotes other commenters, this reflects on comments you do or do not see. When I started reviewing Talkino, I immediately thought of the commenting system introduced last year on the website of the New York Times. Under that system, comments are always submitted for moderation, but those who have demonstrated a history of providing good content are invited to become “verified commenters” and can bypass the moderation process when contributing (among other changes). If you open up a typical article in the New York Times you can see that they have made an effort to improve the comments section by offering tabs for “Reader Picks” (comments that have been “recommended” by those with accounts), “NYT Staff Picks”, and “NYT Replies”. While, NYT allows for “verified commenters” and offers them a special privilege, Talkino offers commenters on a website with an incentive to consistently contribute quality content by providing them with an actual rating. Allowing users to rate each other may go a long way towards fixing that and it will be interesting to see where Talkino goes from here. The way Facebook comments work is similar, but in comparison to any new commenting tool they are easier to use. At first, one does not have to go through a login process, as most are logged into their Facebook account. Second, trolling is less likely, as the comments feed into the commenters’ walls. Third, the upvoting works just the same through likes, and “downvoted” commenters simply get least likes. Reddit, takes a different approach to commenting, as its system pushes posts and threads which receive a large number of “upvotes” up each particular page which essentially pushes threads and comments with large amounts of “downvotes” off the page and out-of-sight. The site’s owners have never been completely open about the special formula that they use, but the site ensures that the most popular content is easily seen and that unpopular material is largely hidden from view. Users receive “karma” (their accumulated total of upvotes/downvotes), but this site lacks the rating-system employed by Talkino. What it does have however is traffic (Alexa rank of 131). The challenge for Talkino will undoubtedly be the marketing: becoming a commenting platform only leads to success when there is a critical mass of users. There are no viral elements for the platform to spread, so marketing dollars is all that will work against the Facebook comments, or other established commenting systems such as Disqus, which use website owners as their marketing tools. In our conversation Talkino founder Ondrej Bobal confirmed that the main objective is to spread the word about the tool, and that a Facebook commenting system is a viable alternative which unfortunately is not always available, whilst commenters with Talkino will be able to comment even on the websites where no commenting system exists. The startup was built by the team of four Czechs, who have been working together for over 15 years. Bobal and his colleagues built the largest car portal in Eastern Europe called auto.cz reaching over 25M page views per month and about 500K unique users. After selling the business to Axel Springer in what has been the first international online acquisition for the German conglomerate the team left in 2010 to concentrate on other projects. It looks like the Talkino founders know how to build an audience, so let’s see this know-how will work for the commenting platform. On a separate note, there is a startup in Russia called Hypercomments, which does not exactly curate comments, but on the other hand enable readers comment any text within any website (as long as website uses its technology). Now, they might not curate commenters (yet) but offer an option to cross-post comments into the social media. Nice and somewhat viral.